As parents, it can be frustrating when our kids show attitudes of ungratefulness. We want them to express appreciation for the things they have and not complain about what they don’t have. It can be upsetting and even embarrassing when our kids are ungrateful. We want our kids to be thankful for what they have but what can we do? Well, here’s the thing. 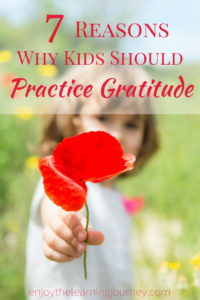 Kids can and kids should practice gratitude and I’ll share some reasons why. Gratitude is simply a choice. It isn’t something that people automatically have or don’t have. When we put our focus on the blessings in our life and all we our thankful for, we are choosing not to think about all that upsets us and everything that’s unfair. There will be those things. But when we step back and practice gratitude we are choosing to focus our energy on the amazing blessings in our life instead. And by writing in a gratitude journal or writing a thank you note to someone we are choosing to put our focus on what we are thankful for. Our kids will soon learn this as they begin to practice. Being grateful actually takes some effort. In order to focus on our blessings we need to put some energy into it. Whether it’s thinking of our blessings, writing in a gratitude journal, or expressing our appreciation to someone, there is effort that goes into it. The sooner kids realize this, the sooner they can put it into practice and turn it into a habit. When we practice gratitude we may realize how much we appreciate a particular person or something someone has done for us. That may prompt us to reach out to that person with a heartfelt thank you or a note of appreciation. People love feeling appreciated and will certainly feel good after receiving that. And especially a sweet thank you or a note of thanks from a child, that might just make their day. Are you more joyful when you think of all you have and love or when you think about what you don’t have and all that is wrong in your life? It’s pretty simple really. When we put our focus on all the things we are thankful for we will be more joyful. It’s the natural result of gratitude. So, when we help our children to practice focusing on what they have versus what they don’t have, we are helping them also choose joy. Gratitude and compassion are very much connected. It’s pretty difficult, if not impossible, to be ungrateful and compassionate at the same time. The opposite of gratitude is ingratitude so if a person is thinking of all the things they don’t have or how unfair things are then they are practicing ingratitude. A natural result of that is often anger and resentment. On the flip side, if a person is thinking about all the many blessings in their life and seeing all they have to be thankful for, they will more easily see the needs of others and feel compassion towards those in need. When a person’s focus is on all they are thankful for, they are not thinking about all they don’t have. So the unfairness and entitlement connection is lost. When people feel entitled to something it’s because they feel they deserve it or that something is unfair. Now, there are certainly things in life that are unfair, I don’t deny that and certainly have experienced those things in my own life. It’s really hard to work through that. However, the way out of that trap, is gratitude. When we continually focus on our blessings and give thanks to God for all he’s given us, we can begin to work our way out of that negative thinking. And we can teach our children to do the same. If you want your children to start practicing gratitude, you can begin with a simple gratitude journal for them to write in every day. They can write and draw the things they are thankful for as they head down the path of choosing gratitude. 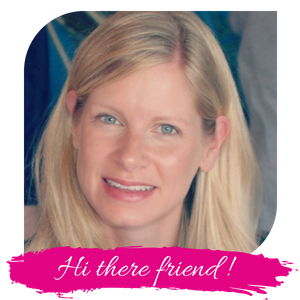 Just click over and grab your free 31-Day Gratitude Journal for Kids. 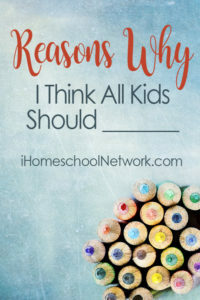 For more “Reasons Why” posts, be sure to head on over to iHomeschool Network! « Do you need a lot of self-discipline to homeschool?